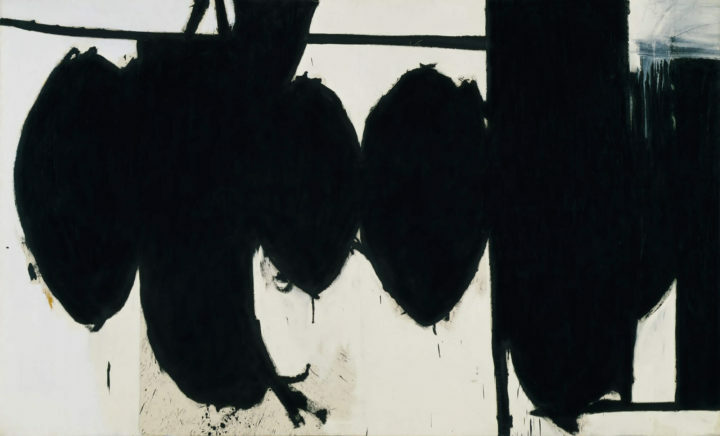 I was first introduced to the abstract expressionist painting of Robert Motherwell (1915-1991) after a visit to the Abstract Expressionist exhibition in Bilbao in 2017. It is, however, Motherwell’s paintings on Elegy to the Spanish Republic, painted between 1948-1967, which interest me most. He painted over 100 paintings on the subject, and was always seeking to paint the experience of painting a picture. He was very interested in “authenticity”: sensing that artists as voyeurs, needed to paint what was in themselves, rather than copy those around them. He felt that by doodling in sketch books, one could discover the shapes and lines which gave expression to one’s inner self. He felt that even if one didn’t understand the language of a painting, others would usually recognise its authenticity. I have found Motherwell so eloquent when he speaks about the Abstract Expressionists and what the movement meant at the time, in the early 1940/1950s in the USA. He felt that “smoothness” was the enemy of any Abstract Expressionist painting; and to me when I analyse their works, they appear distilled and yet edgy. Motherwell quoted Rothko as saying that people seldom realised just how “angry” Rothko’s works were. Motherwell also felt that new art ideas and movements should lay siege to the established citadels of art: an empowering thought for the Abstract Expressionists at the time! For an artist it can sometimes be a long and arduous journey to find this truth about oneself. As artists I feel sure most of us can identify with the desire to paint what is truly within us. Guston, featured in a previous post, always sought to paint the perfect picture, wondering at the end of his life, if he’d ever attained that goal.